Do you know how your favorite local bar got its name? Have you ever wondered why some towns have a wealth of taverns while others feature cafes or saloons? 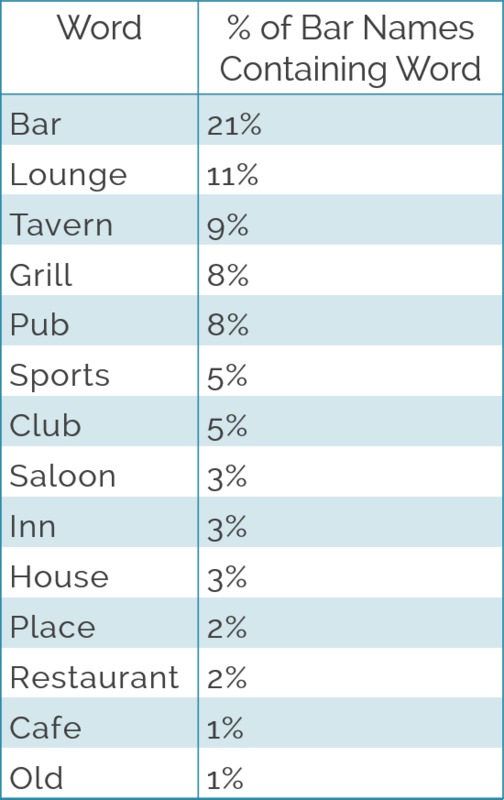 Using Factual’s data and a little research, I took a closer look at the menu of bar names across the US to see what I could find. To start, I used Factual’s Restaurants Database to explore the most common words used in the names of bars in the continental United States1. The top 15 words (excluding “the” and “and”) and respective percentages of US bars who use them in their names are listed in the table on the right. Not too surprisingly, the majority of these terms describe what type of establishment the venue is (“bar,” “lounge,” “tavern,” etc.). I took a closer look at the list to see what the distribution of each type is among the states. The maps below show the percent of bars in each state that contain the key word. The darker the state, the higher the relative number of bars containing that word. The maps are in descending order of overall percent of US bars containing each word2. First I looked into the seemingly bizarre prevalence of “clubs” in Utah (I have always thought of club as a shortened term for “nightclub,” something I had not expected to be so popular in the Beehive State). Upon inspection of the website for the Utah Department of Alcoholic Beverage Control, I discovered that in Utah, a club legally refers to an establishment where you are permitted to order alcohol with or without ordering food. Since the only other places you can purchase alcohol are at licensed restaurants (where you must order food and consume your beverage at or near your table, among other restrictions) and “beer only” establishments3, it’s not surprising that such a high fraction of bars have club in their names. While clubs serve the role many think of as typical bars in Utah, in Connecticut they are members-only establishments who cannot sell alcohol to patrons who do not pay a yearly fee, or those patrons’ spouses or guests. Not surprisingly, the more popular option in this New England state is the “cafe,” which allows the sale of alcoholic beverages on its premises without any sort of membership. Although cafes in Connecticut are required to offer food, unlike in restaurants, the food does not have to be served hot. In fact they are not even required to have a kitchen. Another option in Connecticut is the tavern, which only offers wine and beer, but has the option to serve or not serve food4. This definition of a tavern is common in many states, such as Washington where the option is popular5. Another trend that stood out to me was how common the term “saloon” is in the West. Reading through the history of saloons in the US, I discovered that the first in the country was established in Wyoming back in the 1800’s6. Saloons have since become a cultural icon of the Old West (as anyone who’s seen an American Cowboy movie can tell you), so it makes sense that they’re still common in that region today. Whether they are so designed by local law or culture, the names of neighborhood bars represent the communities they are a part of. Think for a moment about your favorite watering hole. What unique things does it say about your corner of the world? Factual’s Restaurants Data is an extension of our Global Places Data. It contains over 1.1 million restaurant listings in the US and over 200,000 in the UK. In addition to the core data attributes that we offer for all of our Global Places listings (name, address, etc. ), we provide 43 attributes that apply specifically to restaurants. To do this analysis, I pulled all “Social > Bars” records in the continental US from Factual’s Restaurants Data (Category ID 312). From there, I isolated all of the individual words used in the names of the bars and tallied the frequencies of each. Not all of these maps are on the same scale (I did this to prevent maps of words with lower overall counts from appearing washed out). Thus these visualizations enable a state to state comparison more so than a word to word comparison. Additionally, bear in mind that for states with smaller populations (meaning generally fewer bars), the percents are bound to be somewhat more pronounced.